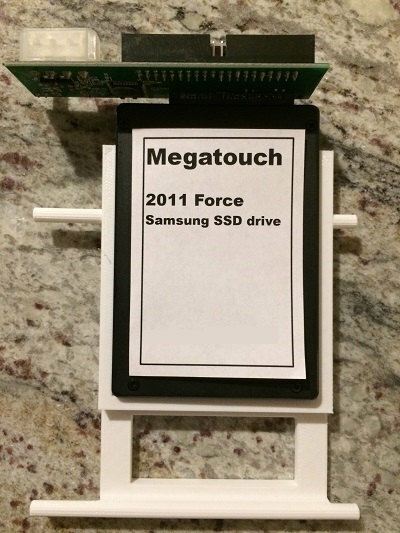 We sell a SSD replacement drives for Megatouch Force© systems. The original Megatouch Force© hard drive were regular spinning ATA hard drives. Spinning hard drives are larger, slower, louder and less power efficient. Additionally due to the mechanical nature they are likely to fail. The average time before failure of most ATA hard drives are 3-5 years. Replace your loud failure prone spinning hard drive with an SSD, installed with your choice of Megatouch© software. These SSD drives have no moving parts, they run quiet, cooler and more power efficient. We provide replacement solutions using fast, quiet and cool Solid State Drives (SSD), with an SATA -> ATA adapter as well as a nice 3D printed mounting bracket that fits the force EVO models. Please note this is NOT a hacked image, a valid security key IS REQUIRED to run the game. These disks were installed with the installation software .iso files that Merit publicly made available on their support website. For each software year, We have used the latest copy of the software that they provided before their website shutdown.